Airolite’s line of extruded aluminum louvers are designed to minimize water penetration through wall openings via drainable blades that provide high volume airflow. 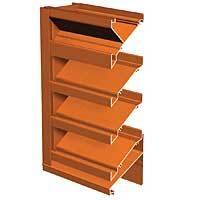 The louvers are available with visible or concealed mullions in frame depths from 4 to 6 inches. All Airolite products are available in 24 standard color Kynar 500 and Hylar 5000 resin coatings, 18 pearlescent metallic flouropolymer colors, custom flouropolymer colors, and clear or color-anodized coatings.